Cosy House Collection COMIN18JU003174 - With our cosy house elegant 1800 series bed sheets, at a fraction of the price! the secret?our premium microfiber - carefully crafted using the finest double brushed microfiberElegant patterned bed sheets that feel blissfully soft & smoothThis finely woven fabric is even softer than silk - with the equivalent of 1800 thread countAttention to detal, you'll enjoy all the comfort & elegance of luxurious high-end bedding, each design is finished with exquisite tailoringResult?Bed sheets so sumptuous you'll swear they came from a Luxurious 5-star hotel. Resist stains & wrinkles, so they always look fresh & cleanretain their rich solid color wash after washEasy to wash by machine - no ironing needed, EVERIn Addition, These Ultra-Luxe Sheets Are HypoallergenicThey won't attract pollen & dust mitesBeautifully packaged in our premium zippered case for GiftingAll This Plus Our Lifetime Warranty Order now risk freeRest assured our Cosy House bedding is designed for years of wear. 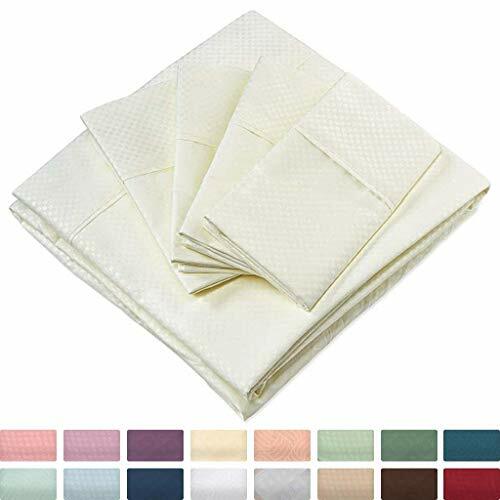 1 Fitted, 1 Flat, 4 Pillowcases - King Size, Ivory Dots - Deep Pocket - Luxury 6 Piece Hotel Bedding Set - Beautiful Matte & Shine Patterns - Cosy House Collection Elegant Bed Sheets - You don't even have to return the original sheets. Plus, 1 flat sheet - 105" x 102", it has elastic all around not just at corners, so it stays snugly in place all night long. The secret's the premium fabric: finely woven microfiber, softer than silk & brushed twice for creamy smoothness. Our generous fitted sheet fits mattresses up to 16" deep. King size set includes 1 fitted sheet - 80" X 78", 4 Pillowcases - 20" X 40". Lifetime warranty: if you're ever unhappy with your Cozy House Sheets, just send us a picture of the problem & we'll refund or replace your purchase. Cosy House Collection - Plus, it's elasticized all around, Fitted Sheet 80" x 78", so it'll stretch taut & stay put all night. No need to return the original! . Our deep-pocket fitted sheet fits up to 16" mattresses. Even the packaging is premium your 4 Pc set arrives safely packaged in our elegant, zippered case, ideal for storage & gift giving. More durable and breathable than cotton, fading, wrinkles & dust mites. Ideal for today's deep mattresses: "pillow-top" bed? no problem. It's even been double brushed for skin-caressing comfort. Result? you'll enjoy more soothing sleep. No other bedding sheets set compares! King sheets dimensions: flat sheet 105" x 102", Pillowcase 20" x 40". 1 Fitted, 1 Flat, 2 Pillow Cases - Cosy House Collection King Size Bed Sheets - Cream Luxury Sheet Set - Cool & Wrinkle Free - Beige King Sheets - Deep Pocket - Super Soft Hotel Bedding - 4 Piece - Ready for elegant gifting: your cosy house Sheet Set arrives beautifully packaged, with a tassel-trim zipper for easy access & storage. But if you do have problems, just send us a photo, and we'll replace your set free of charge. Knit of silky-soft microfiber, stains, our King Size Sheet Sets resist wrinkles, fading & allergens. You'll be amazed that affordable bedding can look and feel so luxe! The Secret? Our Premium Microfiber With its ultra fine knit equivalent to 1500 thread count, this elegant fabric is literally softer than silk. Backed by our lifetime warranty: if you're ever unhappy with your Cosy House Bedding, just send us a photo of the problem, and we'll send you a FREE replacement set.